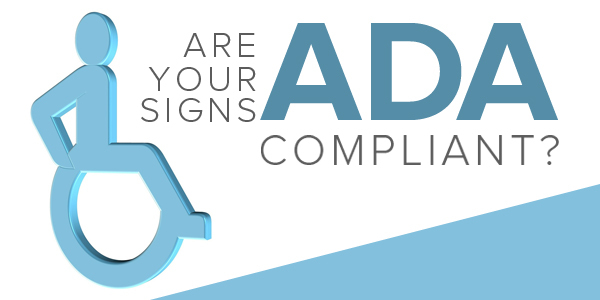 As a business owner why should you pay close attention to the ADA and why should you make sure your signage is compliant? To answer that simply, it is the law. The Americans with Disabilities Act is a bill that started back in 1986 and was written into law on July 26, 1990, by President George H. W. Bush. It’s purpose is to protect people with disabilities from discrimination. It is divided into five titles. Those titles extend comprehensive civil rights protections in areas including public accommodations, state and local government services, and employment. We will go through what the actual law states about each. 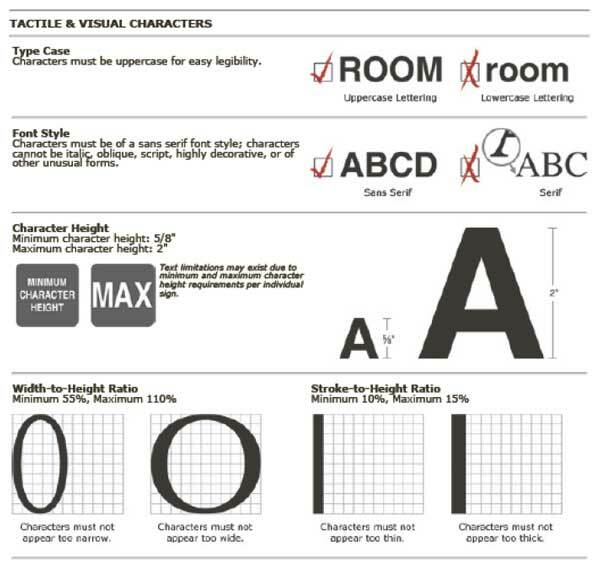 Let’s continue with 4.30.3 and learn about Character Height, “Characters and numbers on signs shall be sized according to the viewing distance from which they are to be read. The minimum height is measured using an upper case X. Lower case characters are permitted. So you have all of that compliant? What about location of the signs and height? 4.30.6 states: Where permanent identification is provided for rooms and spaces, signs shall be installed on the wall adjacent to the latch side of the door. Where there is no wall space to the latch side of the door, including at double leaf doors, signs shall be placed on the nearest adjacent wall. Mounting height shall be 60 in (1525mm) above the finish floor to the center line of the sign. Mounting location for such signage shall be so that a person may approach within 3 in (76mm) of signage without encountering protruding objects or standing within the swing of a door.